Because it Giving Tuesday, I wanted to write about education. Here at CDSS, we talk about education and school a lot, and it has been a very big part of my life. My schooling started in elementary school when I was very young. I learned to do things like read and write and cook and clean and to take care of myself, and I met a lot of friends. I loved when we would sing songs together, and a lot of the songs helped me to learn and understand things. After that, I went to junior high, to a school where my mom was teaching and my mom took me there each and every day. In high school my favorite class was workshop! I had to learn how to use the right tools, and I built a shelf for my parents TV. I still love woodworking and right now am working on building a step stool. Many things you learn in school you will use your whole life. I want teachers to teach people about Down syndrome so that kids can know that I am just like any other kid or grown young man. 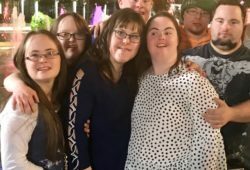 Kids with Down syndrome can graduate just like I did from high school or even follow in my footsteps and go to College and get a great job after. Now that I work at CDSS, I am not done learning yet! 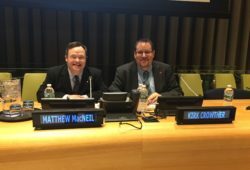 I learn a lot at the Canadian Down Syndrome Society as the Awareness Leader, things like working on the computer and writing and sending out all sorts of office mail and how to deal with peoples questions over the phone. I am also still attending classes at Mount Royal University in Calgary so I can keep learning. We don’t sing songs in university of course, but I am learning all about current events and understanding the world today. I like school because school keeps me going. The only thing I find very difficult about school is graduating and leaving behind the school that you went to and the friends that you made when you were all in school together. It can be scary when you are leaving the school because you have to build a new life out in the real world. Even though I don’t want to be in school forever, I will always keep learning even when I turn 100 years old or longer! 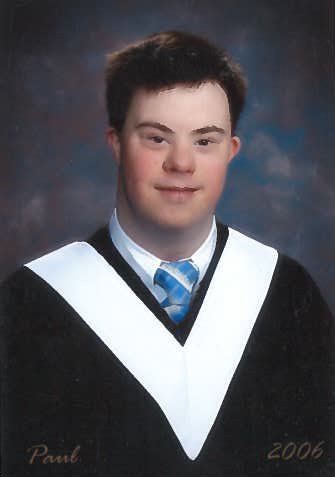 Your donation directly supports self-advocates to achieve their potential. Have a Question for Paul? Do you need advice relating to life with Down syndrome? If you or someone you know needs more information about Down syndrome, ask Paul a question today and he may write a blog post answering it.